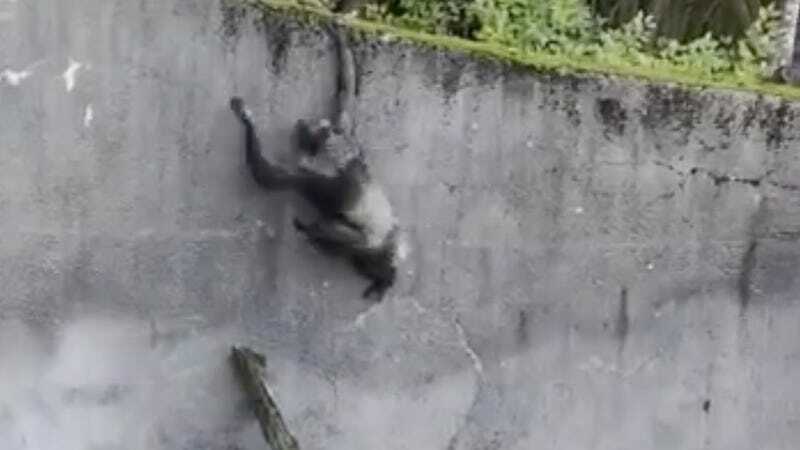 Some incredibly mischievous chimps put on quite a display for visitors at the Belfast Zoo over the weekend by attempting a big break from their enclosure—a daring effort that was captured on video as one managed to get beyond a wall. Video shared to Facebook by Danielle Monaghan—who was at the zoo with her children, partner, and his nieces and spoke with the BBC about the incident—showed the animals managing to fashion a kind of ladder out of a tree branch before scaling it and posting up on their enclosure wall. Another video shared to Monaghan’s page shows one of the animals sauntering across a path following its successful breakout. Monaghan said that while she initially feared that the animal might attack their group, the chimp turned out to be pretty chill. In fact, Chantal Baxter—who was also present during the escape—told the BBC that when her child tried to yell at one, “I think she scared it and it did sort of make its way back up the hill.” This tracks, as I can’t imagine I’d very much enjoy being screamed at by a strange child either. Zoo manager Alyn Cairns told the BBC that recent storms may have made branches on trees in the chimps’ area more susceptible to breaking, allowing them “to break them and use them as a ladder to get out.” Though as the BBC noted separately Sunday, the incident is the second breakout the zoo has seen this year after an endangered red panda got out of its pen in January due to an apparent electrical failure. We’ve reached out to the Belfast Zoo about the attempted breakout and will update this post if we hear back.